High-styled canines work the, uh, catwalks for events benefiting animal charities. Simon the dachshund/beagle mix from Ronkonkoma doesn’t mind — too much — being dressed up to look like a terra cotta orange Chia Pet, so long as he can lap up a little attention when he puts on the retro handmade costume, says his owner, Diane Braun. Braun, an internet technologist who adopted Simon last year from Ruff House Rescue in Island Park, will lead her 15-month-old, 20-pound pet by the leash on the runway at the Paws for a Cause Pet Fashion Show and Adoption Event, Sept. 30 at the YMCA Boulton Center in Bay Shore. Simon, who’ll be wearing a specially tailored orange cotton shirt decorated with artificial aquarium plants for the chia effect, “tolerates dressing up to get all the petting, hugs and love” from humans, says Braun, 38. Think the family member curled up on the floor could be the next Kennel Jenner or Tyson Barkford? Your pet can join more than two dozen dogs dressed to the, er, canines, for a run on the runway. Although plenty of cute pet tricks are expected, the show has a serious side. It’s a benefit for L.I. Against Domestic Violence, a nonprofit organization that places pets in foster homes while their owners live in temporary housing after leaving an abusing relationship. Prize ribbons will be awarded in categories ranging from best human/pet duo, most glamorous and most original costume, to best celebrity look-alike, best tail-wagger and biggest ham. 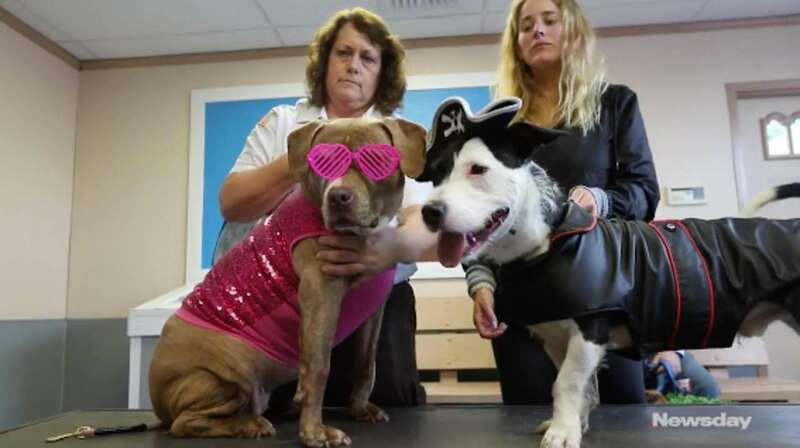 In addition to family pets, five dogs from the Town of Islip Animal Shelter are expected to win hearts on the runway. 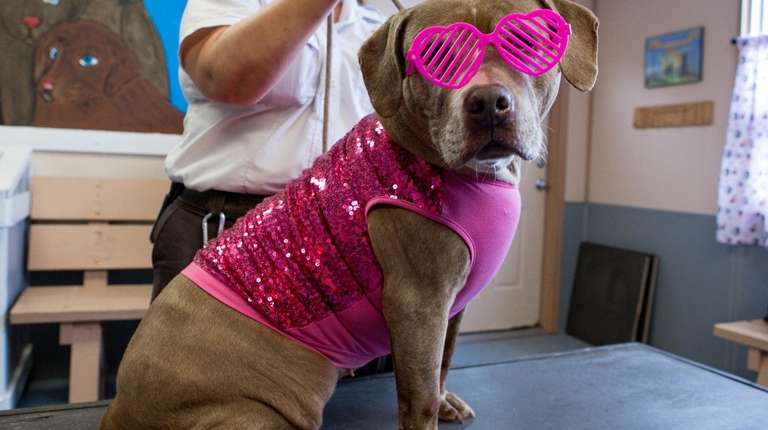 The shelter’s pit bulls, pit bull mixes and smaller dogs will be costumed as a pirate, a supermodel in a pink sequined shirt and sunglasses, a football player (with a football attached to the uniform), a bumblebee and a cow. 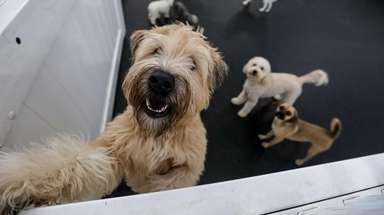 “It gets them out of their kennel, gives them exercise for the day and socialization with other dogs, and they get attention from different people,” says shelter supervisor Teri Giacalone. Adoption applications will be available in the Boulton Center's parking lot. WHEN | WHERE 1-4 p.m. Sept. 30 at the YMCA Boulton Center, 37 W. Main St., Bay Shore. For the first time in its 12-year history, the annual Barking Beauty Pageant will be held on Long Island after runs in Manhattan, New Jersey and Philadelphia. Seventeen contestants, including a Yorkie, a Shih Tzu and two pugs, will come from as far as Boston and as close as the neighboring Hamptons to compete in activewear, glamorwear and talent categories. The afternoon features a cocktail and hors d'oeuvres brunch with $5 Bellinis, Bloody Marys and mimosas. The guest of honor, Annabelle, is a 14-year-old Yorkie, part-time Hamptonite and winner of the 2009 pageant. “She will be my visiting royalty,” says Leslie Kennedy of Westhampton Beach, the pageant's director and founder.